Cons : i prepared my glass with the foil, not aware it was the foil making me ill at my stomach, because my husband was cutting trees down, and smelled of gas. after changing my shirt, i finally smelled my pants, then realized it was the foil that smelled like gas. my husband also said it smelled like old gas. 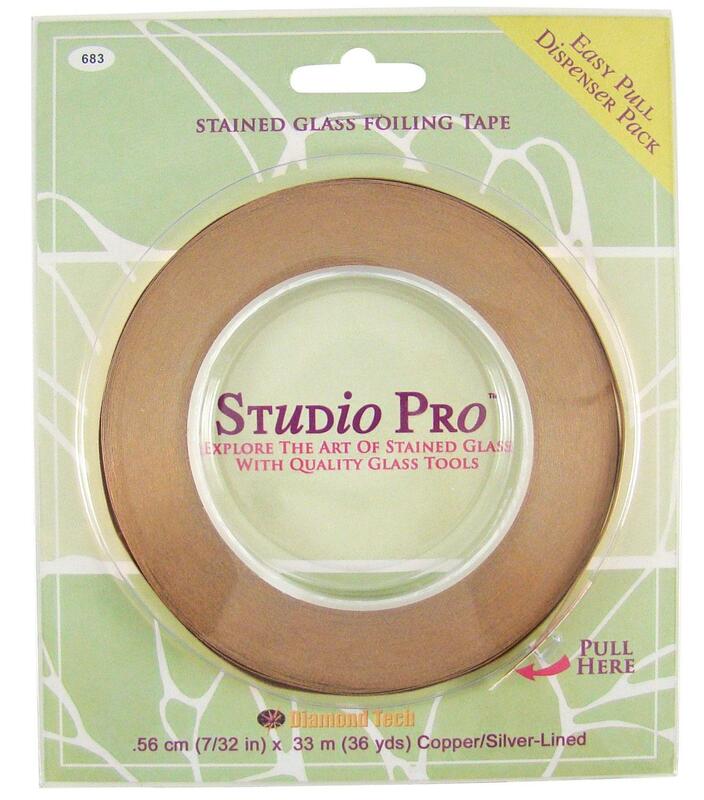 i stayed ill 3 days because of foiling with this product, and only used about 1/2 a package. will not use it again. not worth it! i know the more expensive does not have this effect. just wish i had realized it sooner. would have never thought the horrid smell was coming from the foil, though. Pros : Works just fine. Cons : The silver lined foil's adhesive is less strong than the normal Studio Pro copper foil, so it requires a slower hand to properly pinch and make it stick to the glass. Other Thoughts : I have been working in stained glass for 16 years and teaching for 11 years. I really enjoy the dispenser pack and the lower price of this foil. I find that the adhesive does begin to ooze a bit after a beginner has been 'tweaking' their solder lines a bit much. But, this also happens with other brands of foil. The black backed foils seems to be more obvious. I do not have problems with it not adhering to the glass from the beginning of the foiling process. I will repurchase this product in lieu of the more expensive brand. Pros : this worked fine, was thick enough. Cons : The heavy duty dispenser pack is a real waste of plastic. I'd rather pay less and have it in simple plastic bag like other foils. Cons : Bought this in bulk and then found out it was poor quality. It rips and wrinkles easily and doesn't stick well. Unfortunately if tried it too late to return it as it was passed their 30 day policy. Other Thoughts : If I buy and new brand again I would try it right away so I'm not stuck with something I don't want!